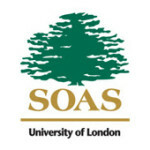 On the 20th of February Dr Azeem Ibrahim will be presenting ‘The Rohingyas: Inside Myanmar’s Hidden Genocide’. The session titled “Rohingyas: Landless Future” was held at Bangla Academy premises with Dr Azeem Ibrahim, former UN under-secretary-general Ameerah Haq, Prof Jeff Kingston from Japan’s Temple University, British journalist Justin Rowlatt, and writer and journalist Michael Vatikiotis as panelists. DLF’s title sponsor Dhaka Tribune’s Editor Zafar Sobhan moderated the session which discussed different aspects of the major humanitarian crisis. 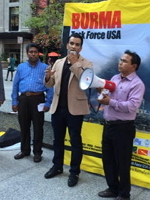 The scope and magnitude of the Rohingya crisis was described in a briefing by Dr. Azeem Ibrahim, Andrea Gittleman, Program Manager at the Center for the Prevention of Genocide at the US Holocaust Memorial Museum; and Mark Storella, a career diplomat and current Deputy Assistant Secretary of the Bureau of Population, Refugees, and Migration at the US State Department. The Rohingyas, a Muslim ethnic group living in the predominantly Buddhist country of Myanmar, are described by the United Nations as among the most persecuted people in the world. Ibrahim argues that the use of religion as a unifying nationalist sentiment has left the Rohingya disenfranchised and marginalized. In his new book, “The Rohingya” (Hurst Publishing, 2016), Azeem Ibrahim investigates Myanmar’s marginalized and vulnerable ethnic Rohingya, a Muslim minority group in western Rakhine State. Dr. Azeem Ibrahim will give a seminar, discussing his new book The Rohingya: Inside Myanmar’s Hidden Genocide (published by Hurst, 2016). The RCC, located on the city’s North Side in the Rogers Park neighborhood, is a refugee resettlement center that will provide support and assistance to Chicago’s growing refugee community. 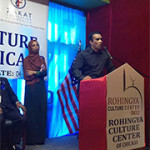 At least 200 Rohingya families have settled in the Chicagoland area in recent months after fleeing ethnic violence in Myanmar (Burma). 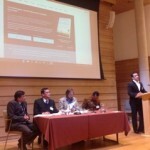 The South Asia Research Cluster (SARC) at Oxford University hosted an open, one-day research conference with renowned scholars, practitioners and experts in law, politics, history, criminology and sociology as well as Rohingya refugee activists on what Harvard economist Amartya Sen calls “the slow genocide” of the Rohingya. 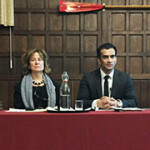 Dr Ibrahim delivered a presentation to an academic audience on the slow motion genocide of the Rohingya in Myanmar with Baroness Helena Kennedy QC, Principal of Mansfield College convening.